Harvest is one of my favorite restaurants in Boston (Cambridge) and over the past few years I've had the opportunity to check out several of their events including the most recent Spring Forage Dinner co-hosted by Chef Tyler Kinnett and Chef Kevin Fink, owner of Emmer & Rye in Austin, TX. 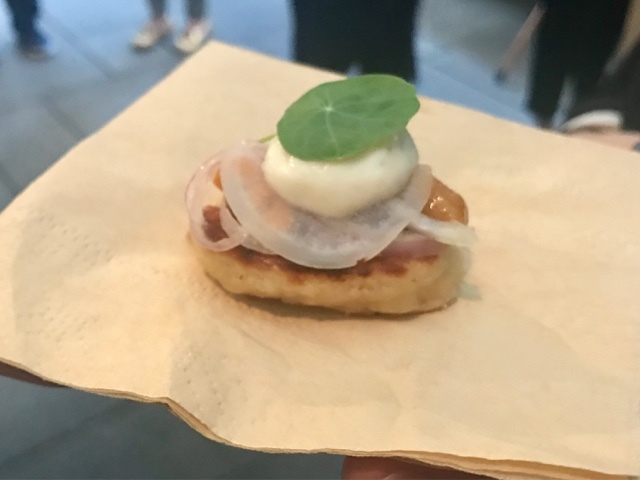 The chefs teamed up with three local foragers (Marcus Ramsden, Tyler Akabane of Mushrooms for My Friends, and Ben Maleson of Wild Mushrooms) to source ingredients for this amazing six-course dinner. We started with some passed hors d'oeuvres and drinks on the patio before heading inside to the private dining room. 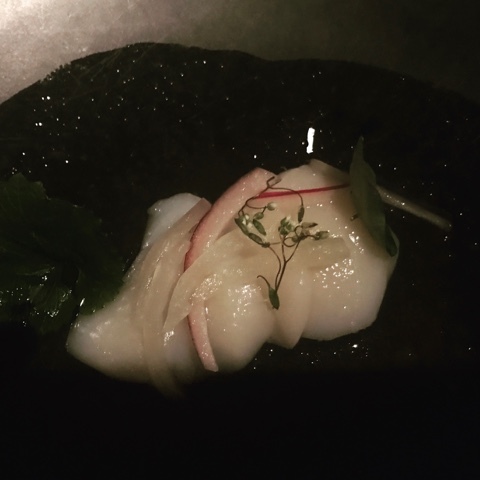 The first course was a crudo of Local New England Scallop with foraged herbs. 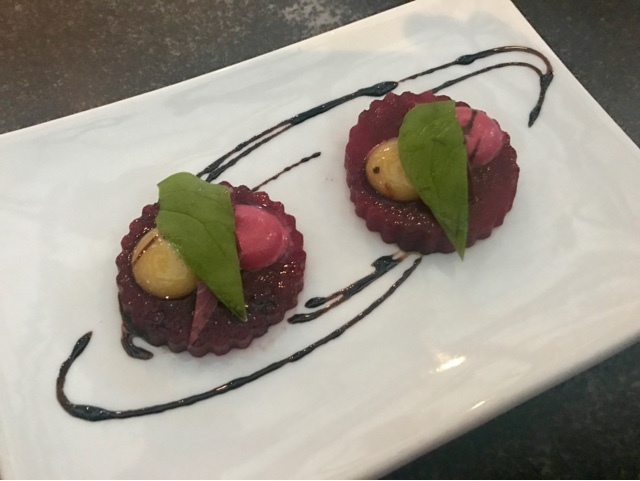 This was a simple preparation, and the light, fresh flavors were perfect for crudo - they highlighted but did not over power the delicate scallop. 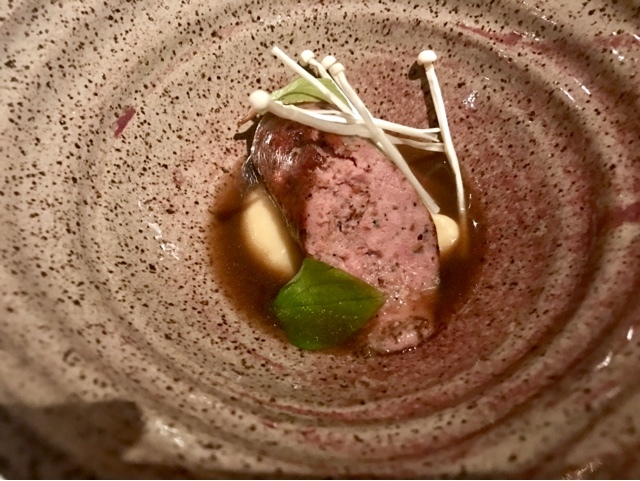 Next was the foraged mushroom boudin blanc with sausage, smoked parsnip, mushroom, and hen broth.This was one of my favorite courses, I loved the contrast paired with the creamy parsnip. 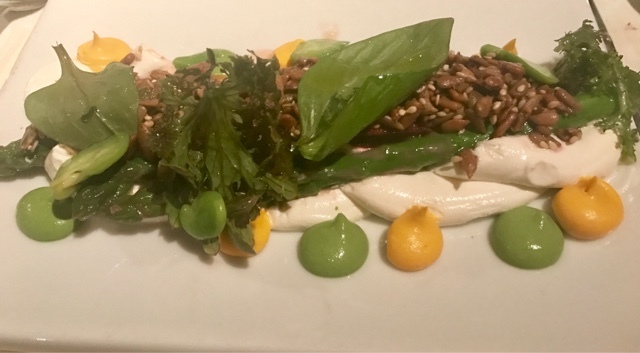 Next was this creamy goat cheese with asparagus and house made granola; it was an interesting mix of light and earthy flavors and textures that all came together for a unique and tasty dish! 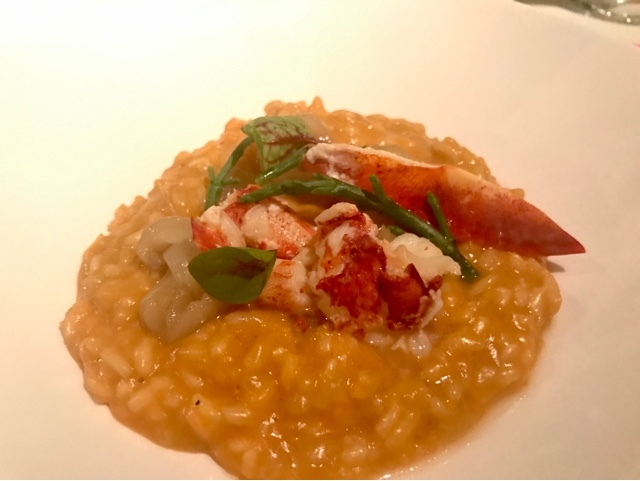 Next was lobster risotto with sea beans; the risotto was rich and creamy and it was loaded with tons of fresh lobster. The final savory course was served family style and included lamb prepared several ways, potatoes, and carrots. I loved the braised shoulder, which was seared perfectly and incredibly tender and flavorful. Dessert was a chocolate tart with dandelion root ice cream. I really enjoyed trying the ice cream; I've never had dandelion root before and this almost tasted like coffee! The meal at Harvest was incredible as always, and I hope to take a trip to Austin sometime soon to try Emmer & Rye!